A tatami mat scene at Yojiya Cafe. Photo by Lizhong / Flickr. 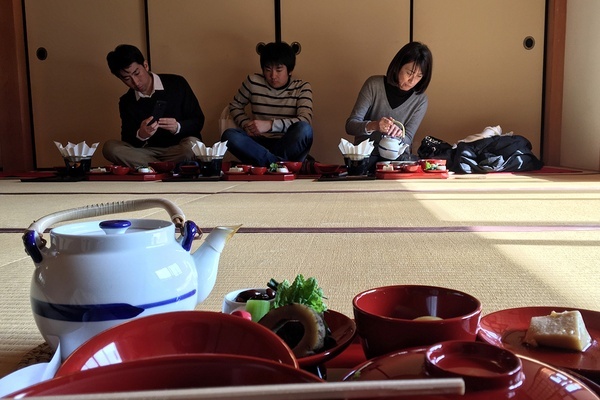 Fathom's Daniel Schwartz recently toured Kyoto on foot in the winter. Here's how he stayed warm in the former Japanese capital. KYOTO, Japan – While winter isn't particularly cold in Kyoto (January highs hover around 45°F), it's important to know how to stay warm between temple-hopping, shopping, and continuous bowing. Because walking and biking are the best ways to see the city, everyone, especially those with cold hands and runny noses, seeks out high temperatures. Here's how. I seized every opportunity to shed my robes at an onsen, a traditional hot spring, where I partook in the virtues of hadaka no tsukiai, or naked communion, with my fellow bathers. It was unnerving at first. The bathtub demographic is predominantly Japanese, there's unwritten etiquette, and everyone knows what you're working with. But the learning curve is quick and, by taking notes from the regulars, I got along just fine. Just shower before and after bathing, keep soap out of the hot spring, switch between hot and cold waters to avoid passing out, and don't stare. When you spot the furnace, you have arrived. 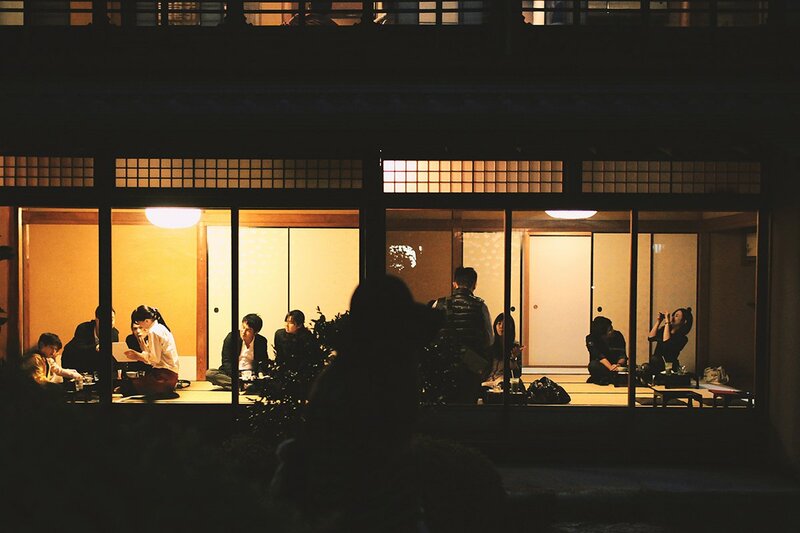 Photo courtesy of Funaoka Onsen. 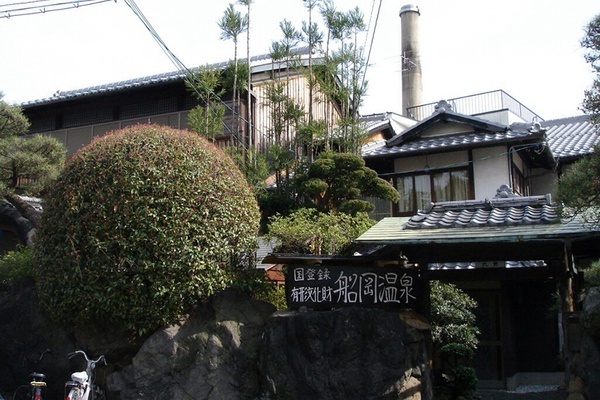 I frequented Funaoka Onsen, the oldest and only remaining onsen within city limits. To be clear, this one's not a luxury spa. There's handsome wooden carvings in the changing rooms, but the interiors are modest and the clientele is working class (it all adds to the experience). It's near Kinkaku-ji (the famous and crowded Golden Pavilion) and Daitoku-ji (the sprawling Buddhist monastery) and it's open until 1 a.m., because nothing's more relaxing than a hot soak after a few beers. For the onsen experience we're all thinking about, there's Kurama Onsen, located at a ryokan in the mountains 30-minutes north of the city. The property has indoor and outdoor baths (opt for the latter), a full-service restaurant, and cheap-but-effective massage chairs. I could've checked out Kibune and climbed Mt. Kurama and made a day trip out of my onsen experience, but I zoned out staring at the stars from the outdoor bath after a long day of sightseeing instead. The original location of Honke Owariya. Photo by Barry Silver / Flickr. A shojin ryori meal at Shigetsu. Photo by Daniel Schwartz. I can't say I tasted the city's best cold-weather foods — I need to return with a Japanese speaker and a bigger bank account to get seats at the restaurants on my list — but I did have plenty of broth. I followed the lines at Kyoto Ramen Koji, a re-creation of an "eat street" (also known as Ramen Alley) on the 10th floor of Isetan department store in Kyoto Station that serves ramen in eight regional styles. I also checked out Ramen Sen no Kaze, a small shop that serves vegetarian ramen, but had soup with well-seasoned chasu pork instead. For soba, I slurped at Honke Owariya, the oldest buckwheat noodle shop in town, feeding patrons and the Imperial family since 1465. While touring temples, I warmed up with plates of boiled, sesame, and miso-topped tofu at Nanzenji Junsei and meditated on succulent local vegetables cooked in a soy milk hot pot from a shojin ryori (vegetarian temple cuisine) meal at Shigetsu within the Tenryu-ji temple grounds in Arashiyama. I had one hot beverage every three hours in Kyoto. It was easy recaffeinating, as modern cafes, traditional tea houses, and hot-coffee-in-a-can vending machines are tucked away around most sightseeing destinations. I found cafes better for photo shoots than quality brews, but I didn't complain when I needed the buzz. 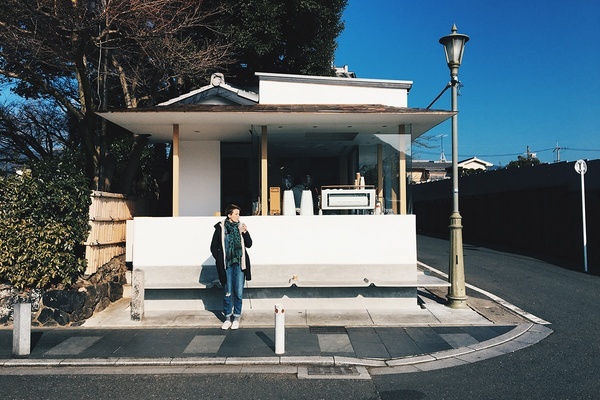 A few standouts were Arabica in Arashiyama and Higashiyama, Efish along the Kamo River (which has a shop and gallery upstairs), and Karirenge, a hipster hole down an alley in an old machiya, or traditional wooden townhouse. Tea was another story. I didn't drink with geisha (deep pockets and strong connections are needed for the better ochaya) and I didn't do the traditional tea ceremony, but I did enjoy excellent tea at every meal and at tea houses, chosen for convenience, that matched their well-prepared waters with wagashi, small and gracious sweets that looked and tasted like art. Arabica in Arashiyama. Photo by Daniel Schwartz. The interior at Sagano-yu. Note the former bathhouse touches. Photo by Daniel Schwartz. Ten Cafe & Shop, located at the base of Kiyomizu-Dera, uses beautiful ceramics, which they sell on site. 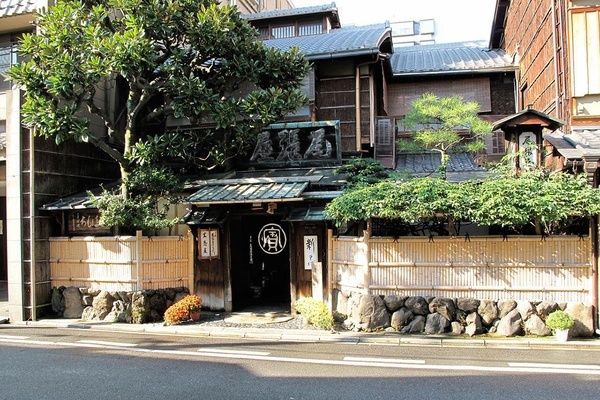 Kagizen Yoshifusa, in the geisha quarter of Gion, has been selling confectionary and matcha since the Edo period. 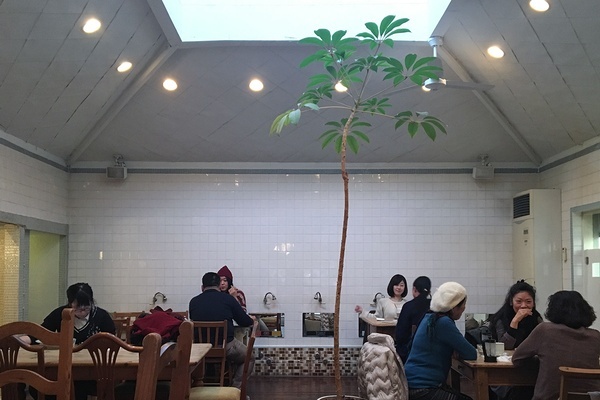 Sagano-yu, an old bathhouse converted into a cafe away from the crowds in Arashiyama, has tea, coffee, pancakes, and light lunch. Yojiya Cafe offers respite from the Philosopher's Walk with tatami room views of their private garden. After hours, there's the small counter at Yoramu Sake Bar, where a few rounds and an education on sake (which isn't easy to find when you don't speak Japanese) from Israeli owner Yoram helped keep the spirits up. Gion Niti, which I visited on the night before my departure, prepared fine wagyu to accompany the kumquat cocktails and Japanese whiskey we were sipping. As if to punctuate seven days of good service, the check came with origami created by our host, who folded paper with record speed behind the bar. What a classy way to leave Kyoto.